Opaque white plastic, leak resistant lid and a metal frame with four-piece 2" white metal garnishes. 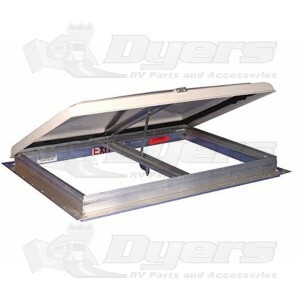 Large exit vents admit three times more fresh air than conventional-size dome vents. Vents open easily with either opening mechanism and hold at any position for air control. Fresh air ventilation: a turn of the crank provides a large vent area, lets air through, and keeps insects out. Includes opaque white plastic lid. Sturdy frame installs easily and is made of heavy aluminum extrusion to assure secure mounting. Dependable operation featuring leak-resistant lid and weather-tight frame. Instant exit. Screen opens quickly to assure fast exit through opening. A strong fine mesh screen. Rough Opening: 25-7/8" x 25-7/8"
received the vent in only a couple of days, (did not pay extra shipping). fit the opening perfectly. so far no leaks. Fits well where old vent was without any modifications.